Martial Instructor - Boca Raton Karate & Kickboxing Academy (formerly Tiger&Dragon Boca) is run by Black Belt, Sensei Douglas Tate. Sensei Doug grew up in Ohio, under the tutelage of his uncle, Mark Miller, 9TH degree black belt in Tracy’s Kenpo Karate. Doug Tate began his martial arts training and teaching at the age of 8 with Mark Miller and his 11 Tracy’s Kenpo Karate schools in the Cleveland, Ohio area. Doug Tate holds rank in Kenpo and multi-style karate systems and is a certified shootfighting instructor. Doug has been studying the martial arts over 17 years and has taught Kenpo 4 years as an instructor in Ohio. Since living in Florida, Tate continues his studies and has opened the Boca Karate & Kickboxing Academy in July of 2009. It’s a very good idea to get and stay in functional, healthy shape. It’s a good idea to get a good coach and great training partners, as the community you’re in strengthens your own practice. It’s a good idea to learn the basic techniques of personal defense, just in case you might ever need them. It’s a good idea to commit yourself to a long term training program that is safe to participate in, taught by highly skilled teachers, and that is complex and interesting enough to fight boredom. Every good martial arts school, our’s included, offers prospective members a free trial program –so that they might test drive the school before beginning their adventure. Call or text 561-926-1846 for our free 1 week trail guest pass, good for 2 adults by the way, should you like to bring someone with you (support is good). Happy Mother’s Day. 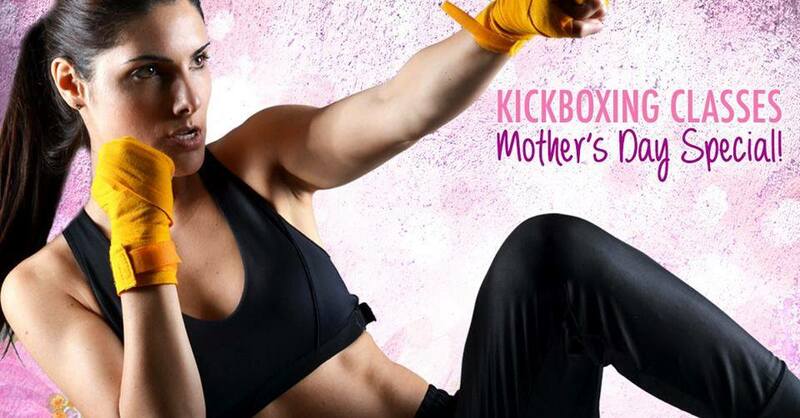 Mom’s if you’ve ever thought about try kickboxing now is the time. Join us for a classes and enjoy 50% off when you decide to join. kickboxing classes in Boca Raton. Mom’s join us in May, Try a free week of classes.